Proud to be a beer snob? This fantastically boastful bar sign helps you toot your own horn and make fun at yourself, all at the same time. It also reminds those fizzy light lager loving friends of yours just how lucky they are to be enjoying the company of someone so cultured. Who knows, it may inspire them to rethink their barbaric drinking habits. We’re obviously being a little over the top here – but that’s what makes it fun. This dapper man and his finely manicured mustache bring lighthearted humor to the most sophisticated drinking establishments and let’s be honest, if you can’t laugh at yourself – everyone else is going to. Awesome sign! No explanation needed. Reflects my husband's attitude about the beer he thinks is good and the lager I like instead. 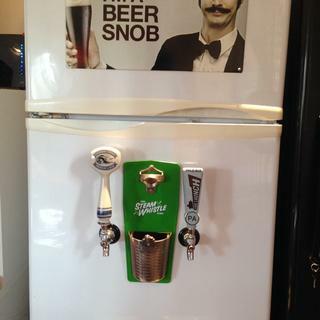 I saw this is a brewery and knew it would be the perfect birthday gift for my brother! We have this sign in our own basement, and our son-in-law asked us to leave it to him in our will. I didn't think he needed to wait quite so long.